An extraordinary and exclusive illustrated book on the younger history of Munich. A unique coffee-table book for all lovers of Munich. The idea for this book came to Nikolai A. Behr in the year that Munich celebrated its 850th birthday, and in which his late mother Chris Nowotny would have turned eighty. After searching through her archives, Behr revisited all the places that she photographed almost five decades previously. Behr took pictures of the same locations, although not always from the same angle. To complement this selection of photographs, he has included many of the buildings and squares that have sprung up over the past few years. 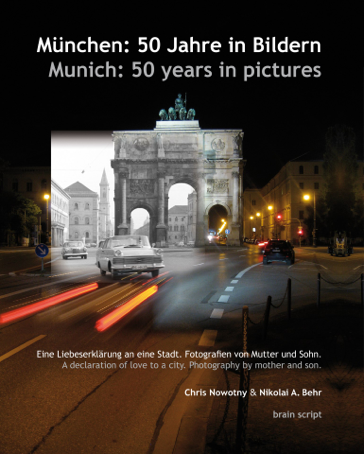 This pictorial compilation of Munich past and present comes alive through its contrasts, and provides a captivating snapshot of the city’s recent history.